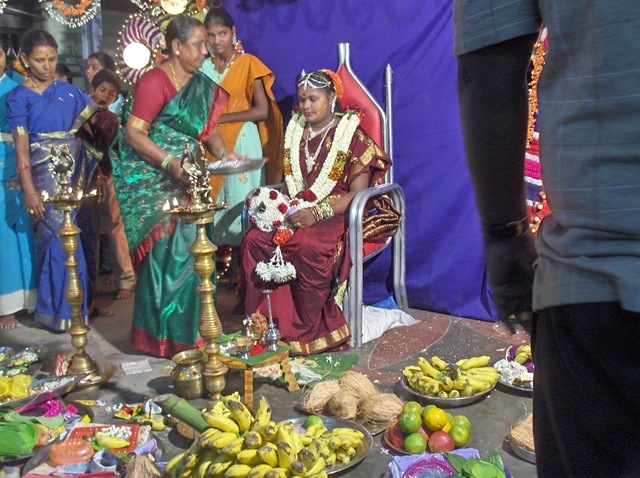 The Tamil Manjal Neerattu Vizha ‘function’ (‘Turmeric Bathing Ceremony’) is the last part of the coming of age celebration for a Tamil girl. 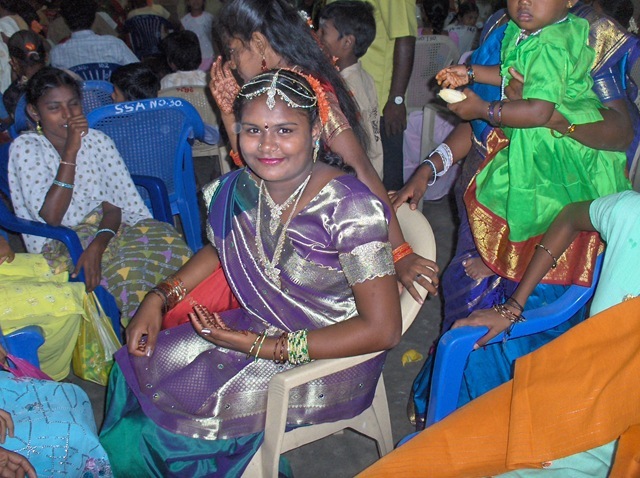 This is done after the girl’s first menstruation, and marks her transition into womanhood. 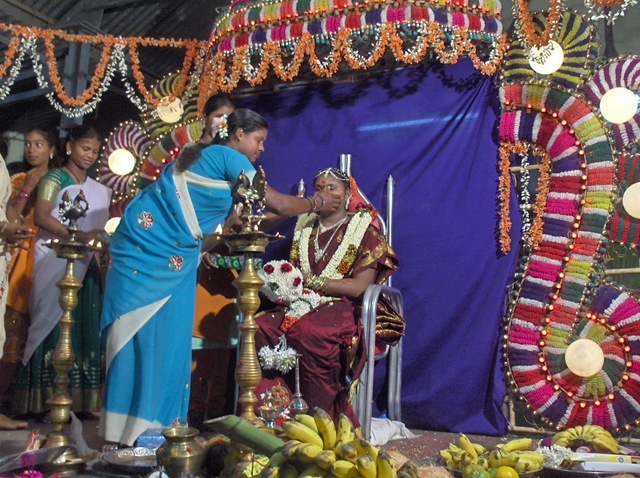 Most Hindu ceremonies are done by men, but this one is primarily done by women. It is a joyous time. 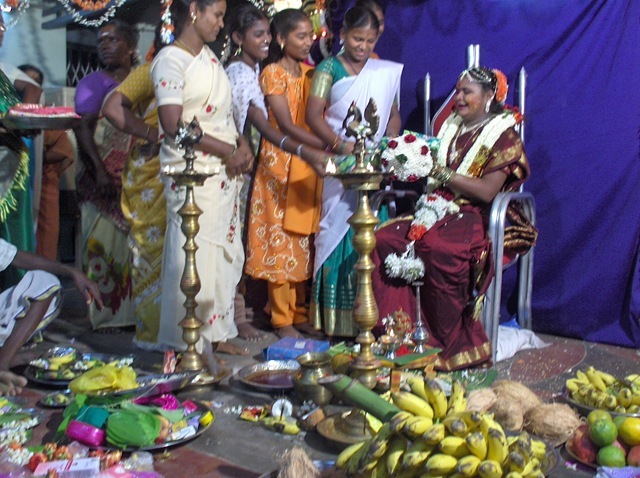 The Tamil coming of age ceremony starts, when the girl’s first menstruation begins, with a period of ritual seclusion. The girl sits separately on a wooden plank in a corner. 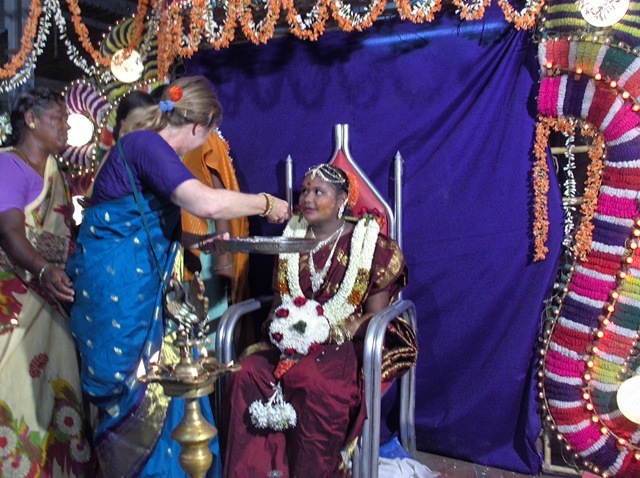 Neighborhood women gather for a ceremonial meal that is served on banana leaves, after which they paint the girl’s feet with a mixture of red ochre, turmeric and limestone. 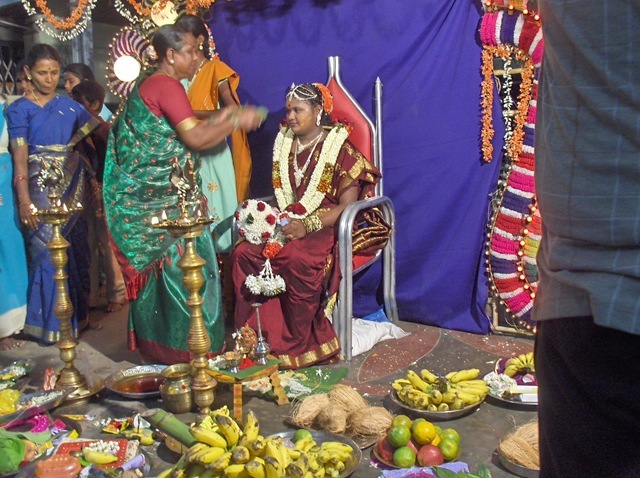 This nalangu ceremony is enacted in the same manner whether the occasion is the first menstruation, as part of wedding festivities, or the celebration of a woman’s pregnancy. 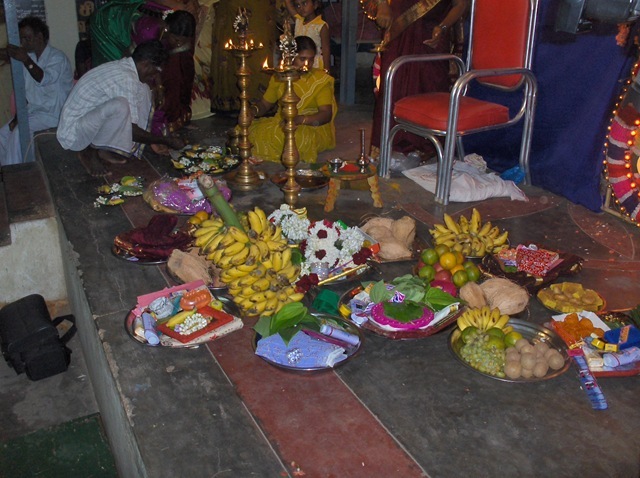 For ritual seclusion, a kudisai (hut) is made of fresh leaves, from leaves of coconut, neem and mango, among others. This hut may be either inside or outside the house. The kudisai is furnished with all the things needed by the girl, including toiletries, clothing and vessels. Food is brought to her, and she takes complete rest. She is helped by other women while bathing. 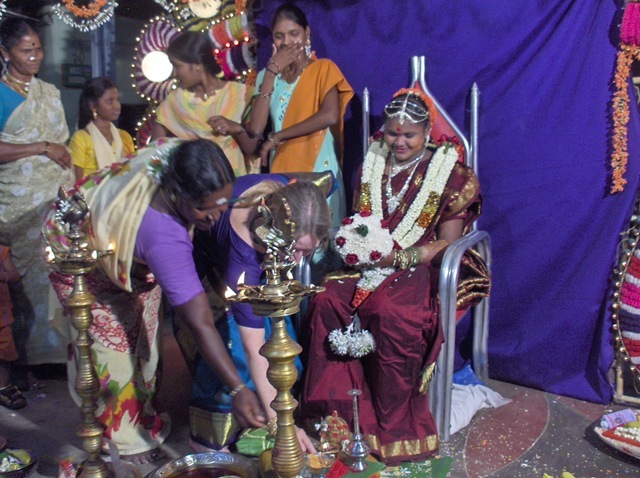 Daily bathing alternates between ‘head-bath’ and ‘ordinary bath.’ When she goes to the toilet, she must carry neem leaves and something made of iron, to ward off evil spirits. Special foods are prescribed for this seclusion, which is continued for 9, 11 or 13 days (it must be an odd number of days). During the seclusion, the girl is instructed not to look at birds on an empty stomach, not to go out alone, and especially not to go into the pooja (prayer) room. She is warned not to leave leftover food where dogs could get it, because she would get a stomach ache if a dog ate the leftovers. 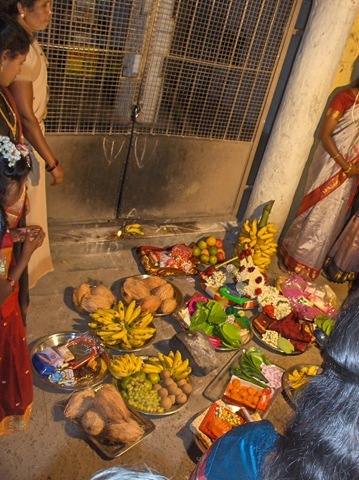 Further restrictions symbolize her ritually dangerous status: she should not touch flowering plants (they might wilt), and she should not touch stored food items such as tamarind, rice or salt, which might be spoiled by her contact. 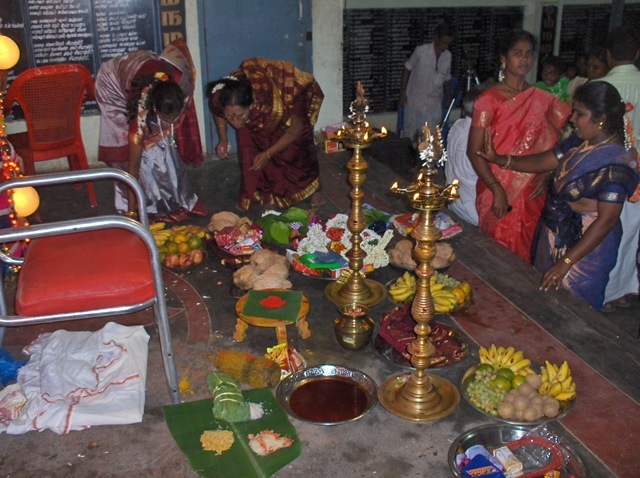 The girl is relieved of the seclusion only after a purification ritual called puniya-thanam, which is the second step in the ritual process. Above, taken from an article from www.unescap.org. 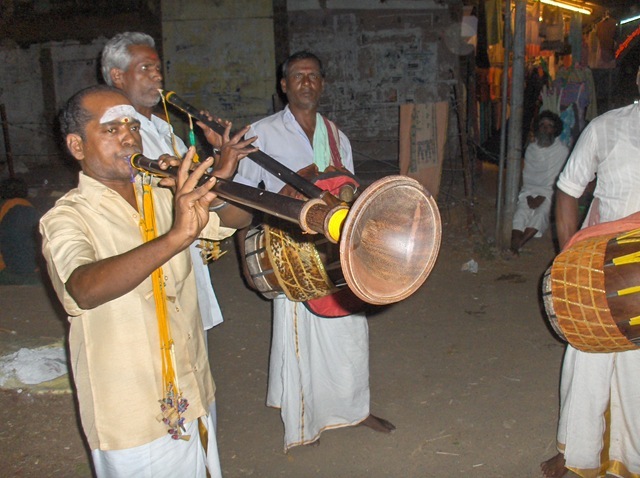 The third and final part is the Manjal Neerattu Vizha, a lavish public function, where the men folk and friends are all invited. 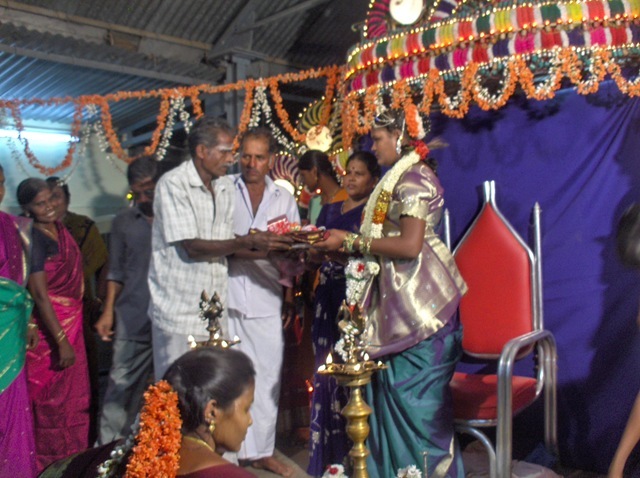 The girl’s maternal uncles are supposed to gift her richly. The girl gets her first saree, which is made out of silk. 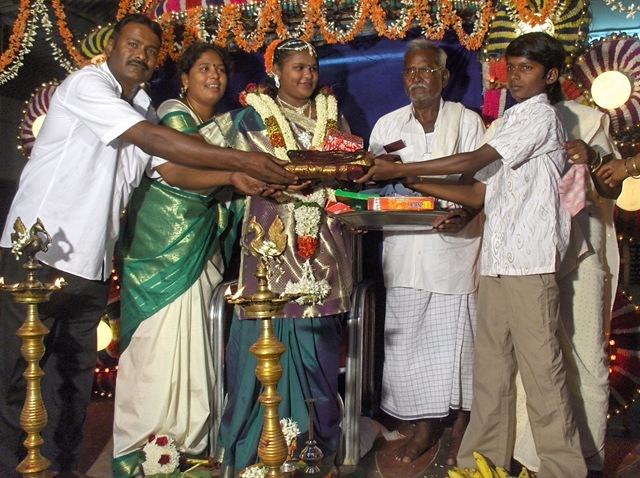 The girl’s grandparents are supposed to gift her sarees. The girl wears the saree for the first time on this day. Gifts are also given by family friends. 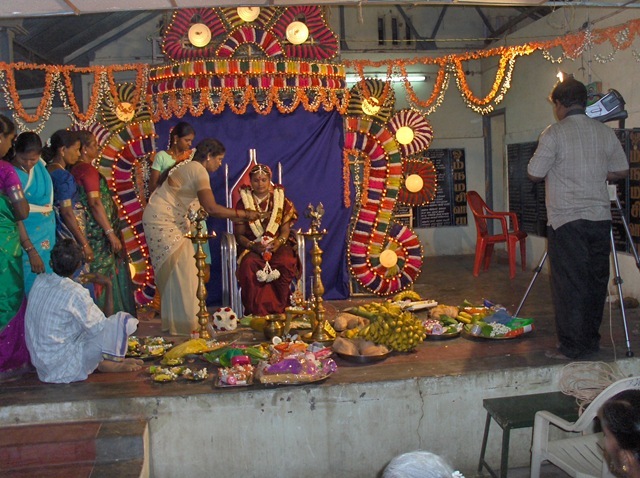 Elaborate pujas are performed, both at home and in the public function. 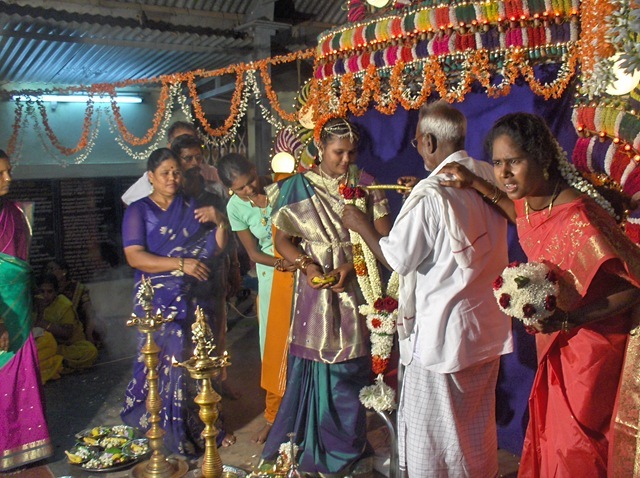 Although the custom is on the wane, it is very much visibly present in the society, especially in villages in smaller cities. 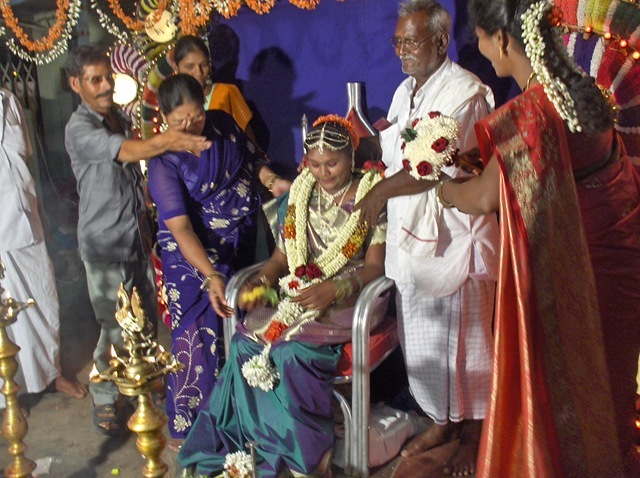 The young woman is dressed almost like a bride, with a silk saree, and much gold jewelry. 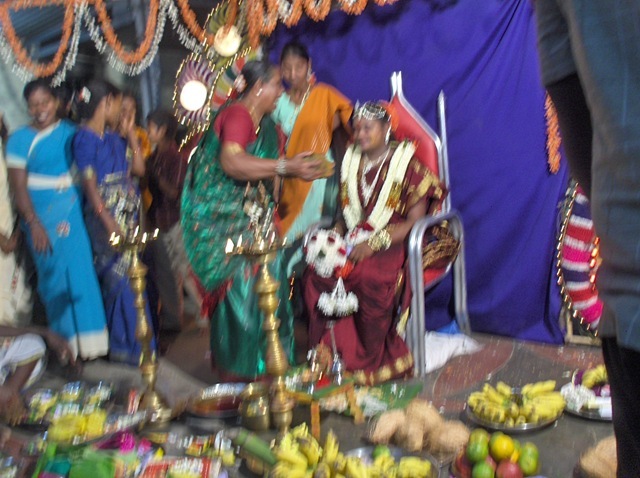 Some say that this function is the announcement of a marriageable woman, and serves as notice to prospective husbands and their families of a bridal possibility. 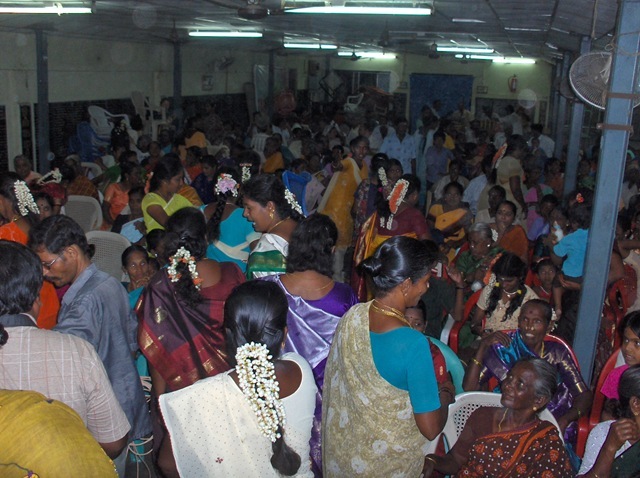 This photo essay shows the public function done on 15 March, 2009, in Seshadri Ashramam (Near Sri Ramanasramam) in Tiruvannamalai. and the father and mother and the friends. 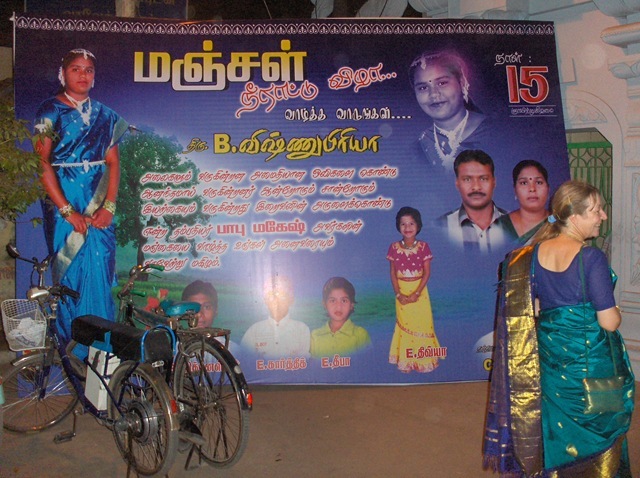 Here’s another hoarding erected by the family, with pictures of the family members. 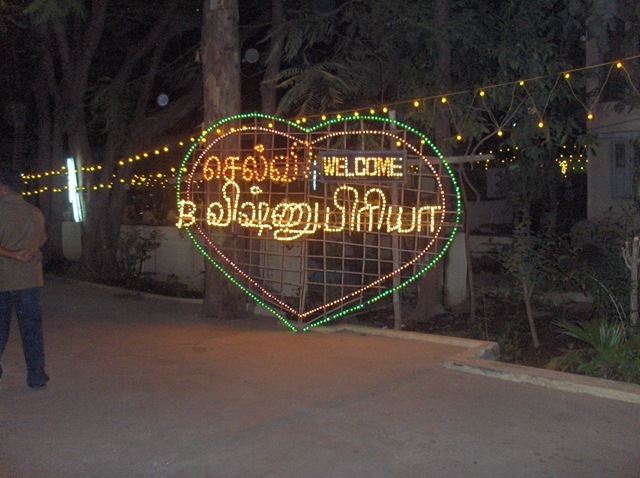 Like with weddings, a sign with the girl’s name in a heart greets us. 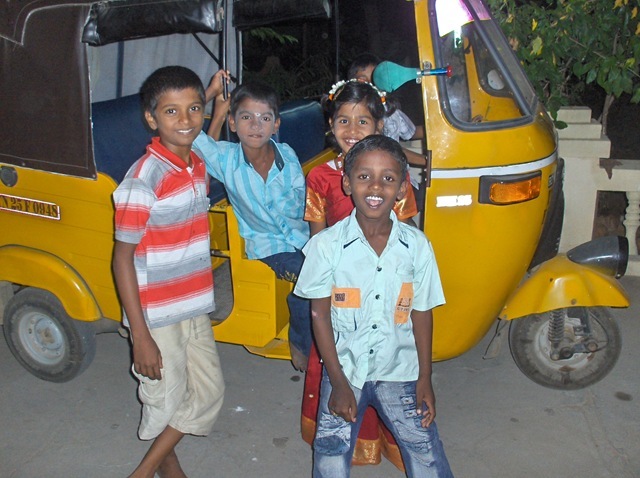 We pass by children playing in a rickshaw, maybe their father’s. 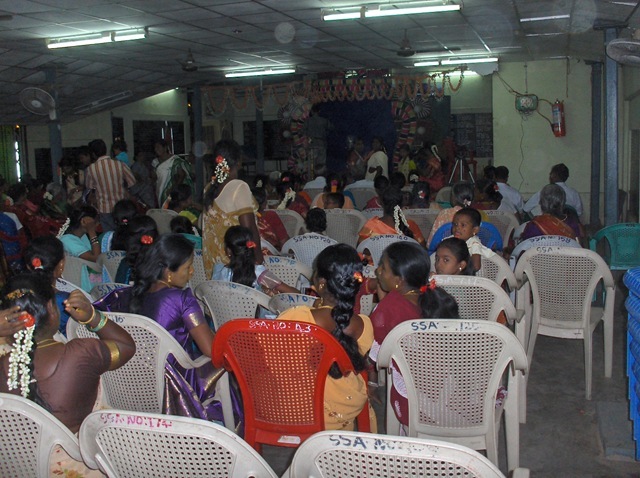 The ceremony is in a big hall in Seshadri Ashramam. Musicians are playing in the back of the room, sitting on a platform made of tables. In the very back of the room is the girl who is tonight becoming a woman. She is wearing a ‘half saree’ to begin with. There is a photographer and a man with a video camera (and bright light) who is videoing the occasion for the family. Chairs and people fill the room. In the front there is a platform with a special chair and fancy decoration and flashing lights. This is where tonight’s ceremonies will be held. In front of the chair, some gifts are being placed on metal plates for later. 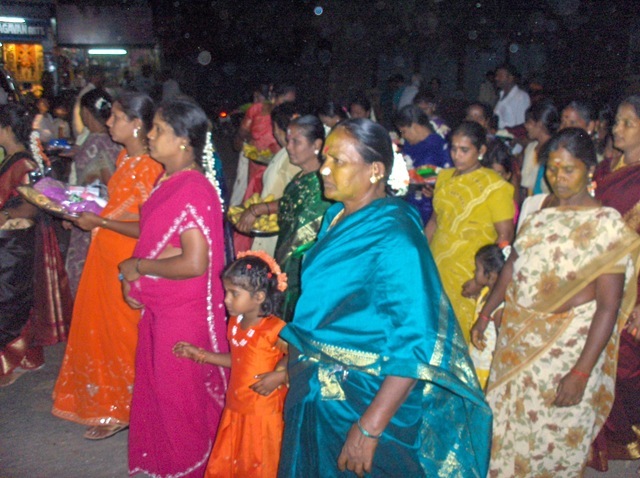 Many Tamil ladies are here tonight, many dressed in their best wedding sarees (silk with gold threading). Carol was told to wear hers tonight. 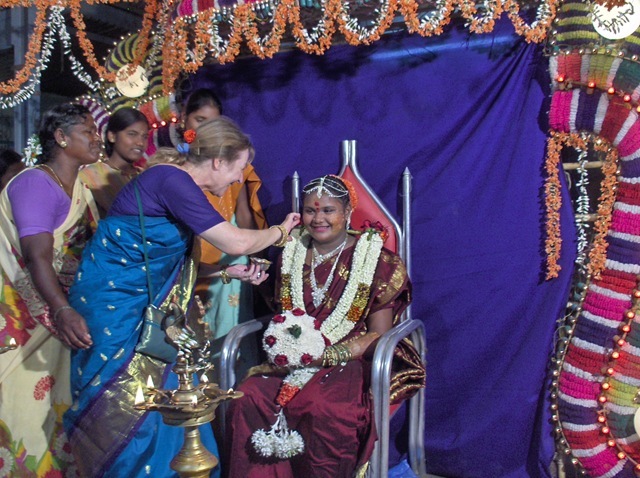 The girl sits among her friends before the ceremony. Her chair is surrounded by other young women. 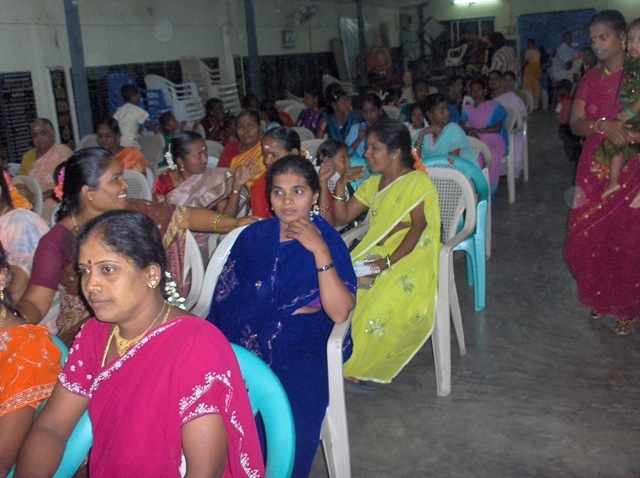 None are in sarees; they’re all too young. 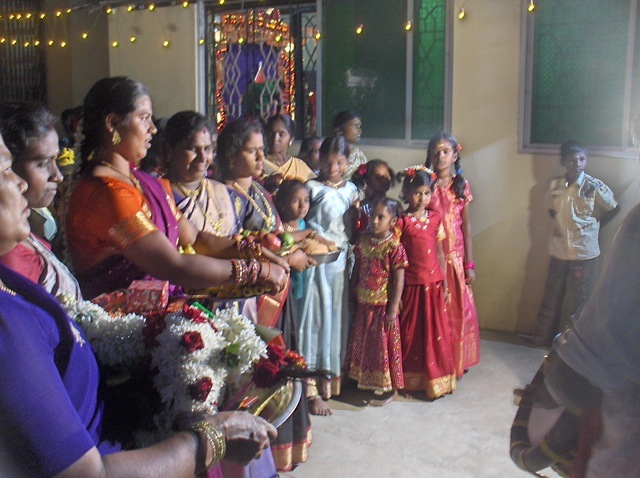 The ceremony starts with a procession from the Ganesh shrine just west of Ramanasramam. The musicians are here. They are playing now, and will lead the women in the procession. 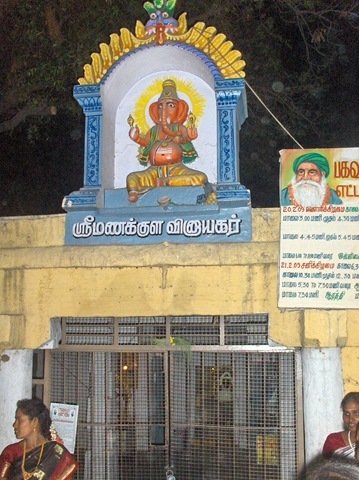 The woman are gathered around the door, in front of the Ganesh shrine. This procession starts from here, since Ganesh, the remover of obstacles, is always a good place to start anything. 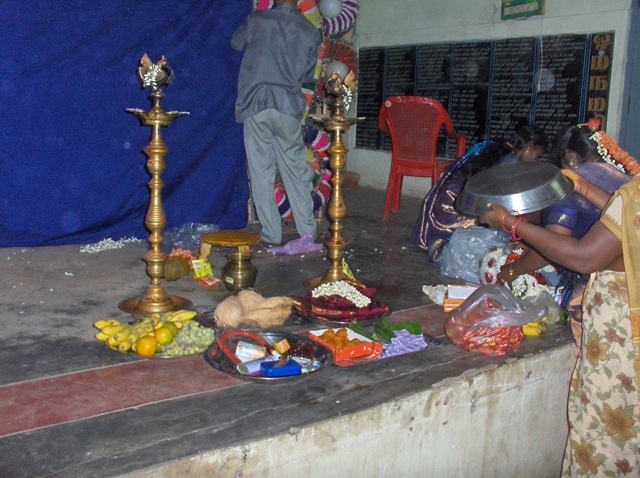 Puja and gift items are laid out at the shine entrance. Now the procession is ready to start. 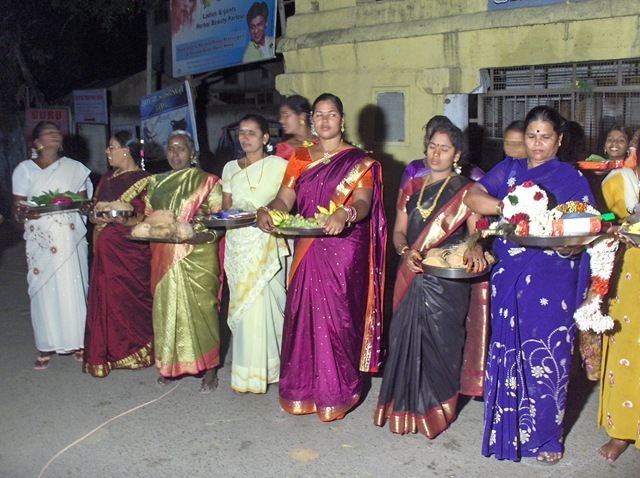 The puja and gift items are carried in front, by women family members, dressed for the occasion. 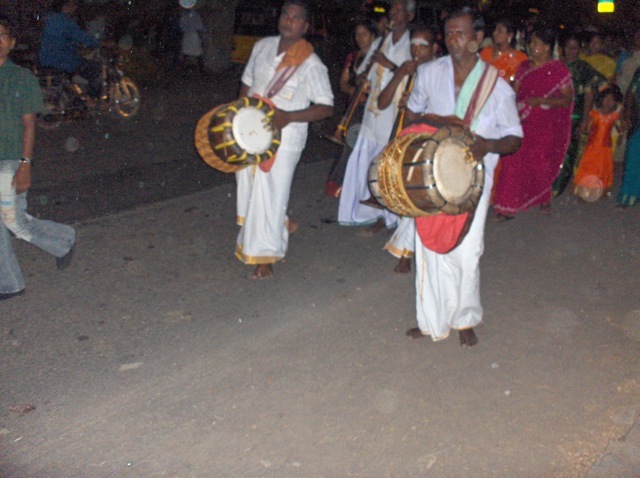 The drums and pipes precede the women. Right behind the family women, other women, neighbors and friends, join the procession, carrying the special items for tonight’s ceremony. In the very front is a group of men, I guess, ‘clearing the way’ for the musicians and women. 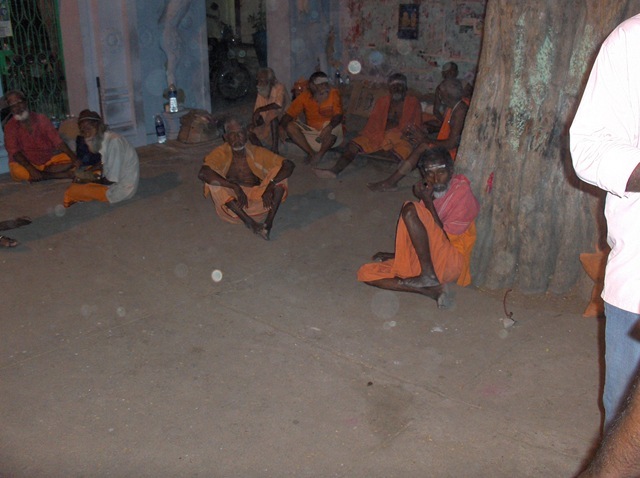 At the entrance to Seshadri Ashramam, sadhus sit and watch the show. 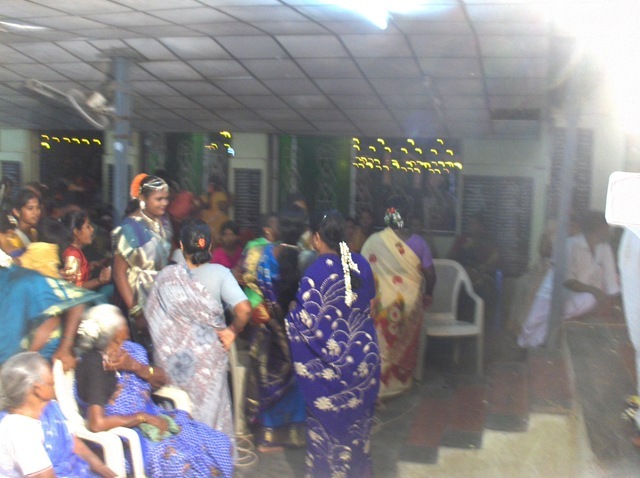 The women gather by the entrance to the hall. 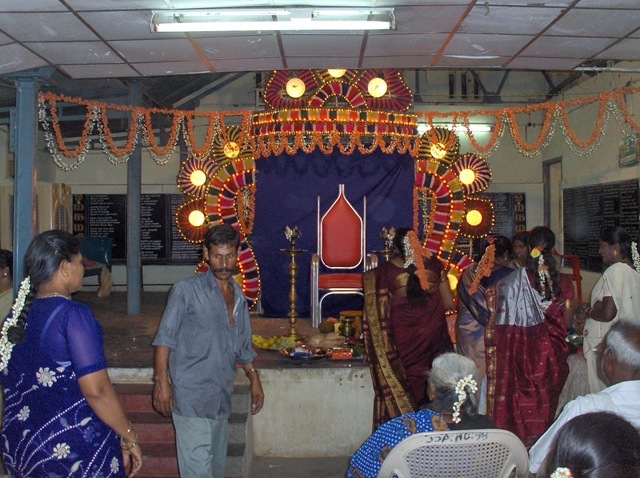 Then go into the hall and place the ritual items on the platform. The hall is filled with about as many people that can fit in. Quite a crowd! 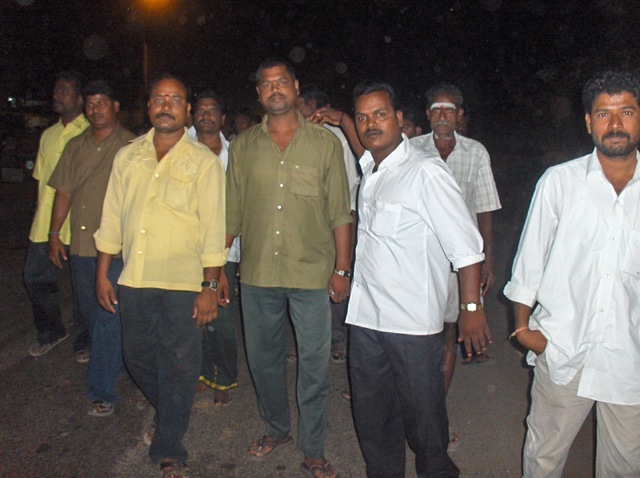 Babu is just a humble rickshaw driver, but he has so many friends and family members who have come tonight. We saw only four other Westerners in here tonight. I think the crowd was maybe 400 people. The girl walks to the stage. First a BIG mala is placed around her neck. I have seen similar ones only at weddings. 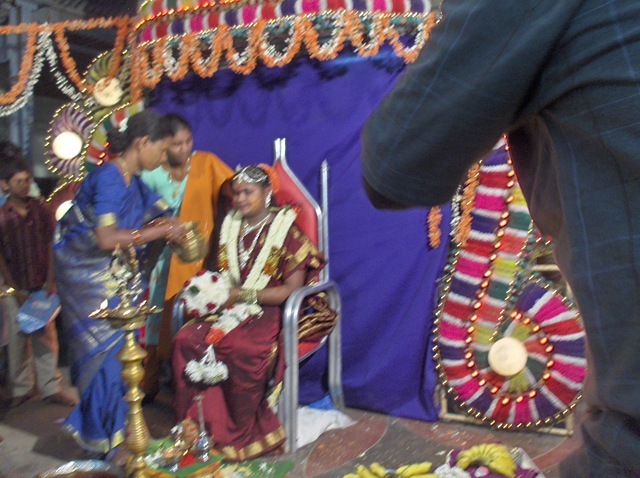 She pranams the people gathered here tonight. Father and mother are to the left. Other members of maternal uncle’s family presenting gifts. 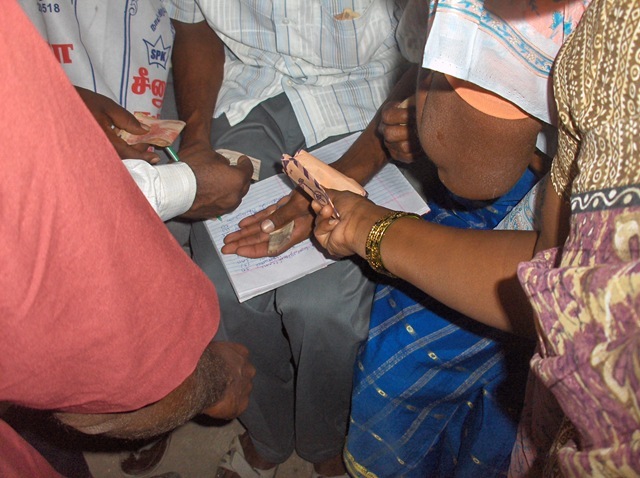 Outside, money is being given to help Babu pay for the festivities. A record is kept of the donations. Feeding has started. There will be a number of ‘shifts’ at the dining hall. This is needed to accommodate the many people who came tonight. Friends and family members are serving. Among the servers we see familiar faces from the rickshaw drivers we know. 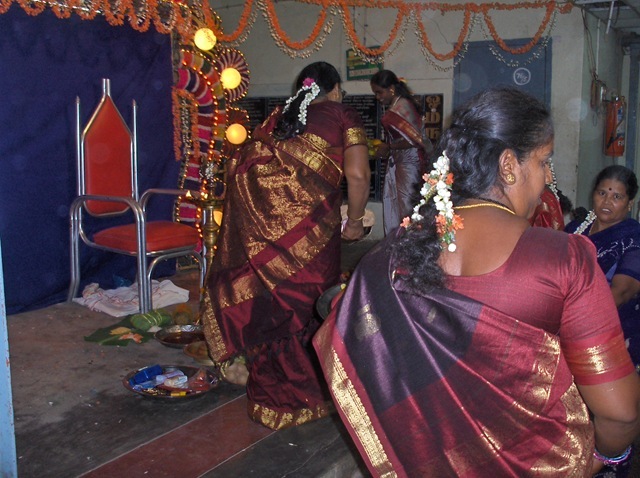 Back in the main hall, women are gathered, each going through a special rite which welcomes the new woman. 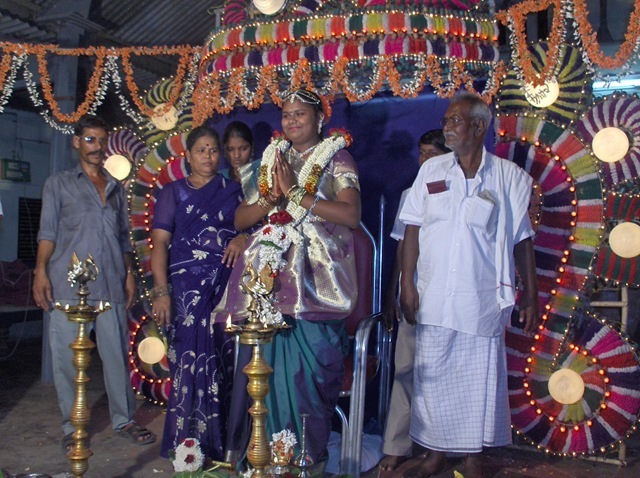 Notice that she is now wearing a different outfit, this time her first saree as a woman. 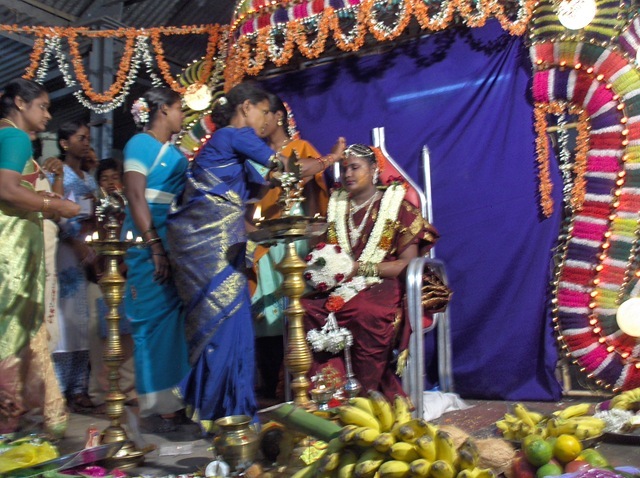 First kumkum is placed on an idol, then on the girl’s forehead. Then turmeric is rubbed on both cheeks and forearms. 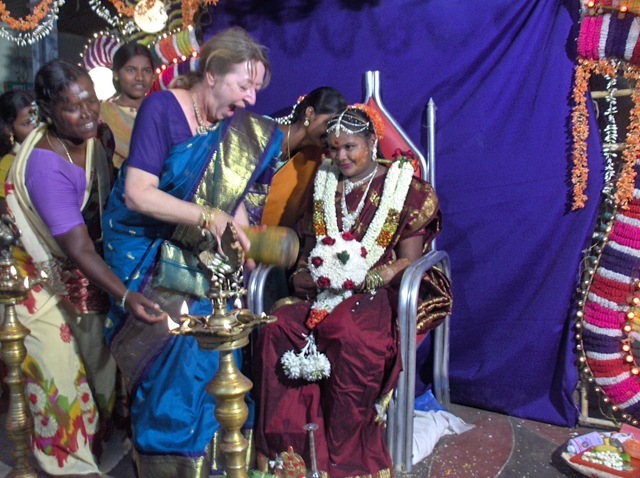 A pot is waved in front of her. 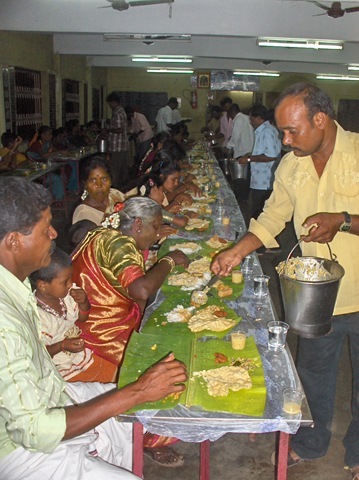 Finally food, wrapped up in a banana leaf, is waved. The last step is to take some kumkum dissolved in a plate of water and dab her forehead again. More gifts may be given as well. 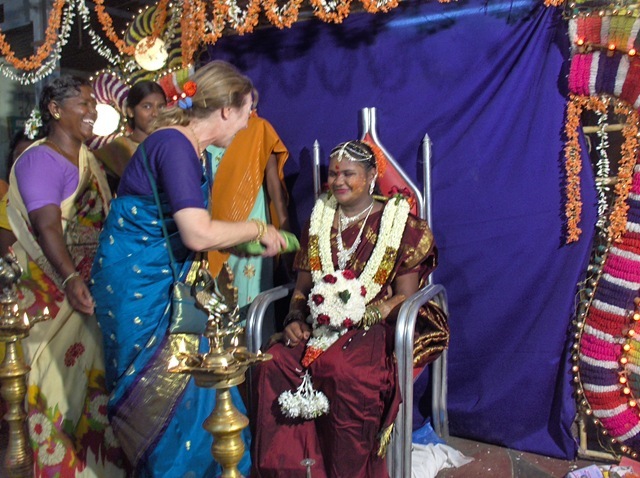 An Indian friend, Velan, suggested to Carol that she should go up and participate. 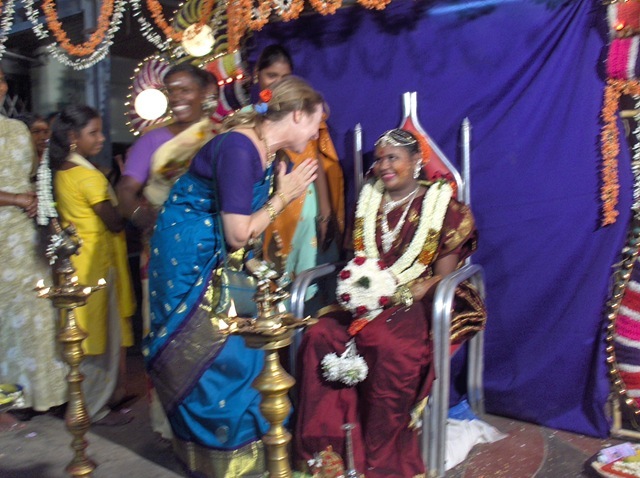 She did so, and the Indian woman were so happy to see her do this (and wearing the right saree for the occasion. 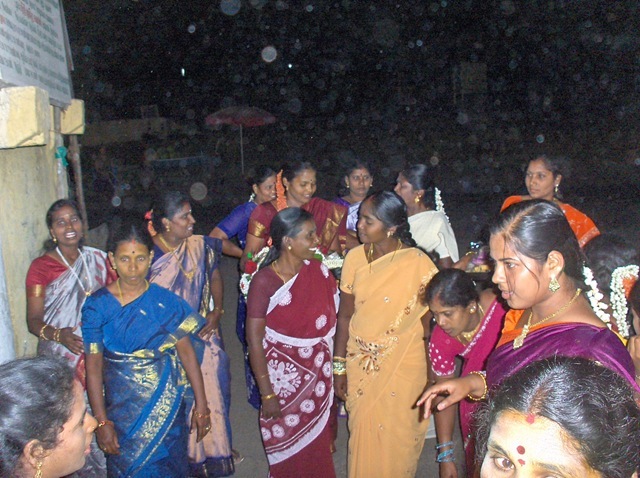 The wearing of sarees, they feel, is a gesture of respect for them and their culture). One of the women helps Carol through the steps. Then the rubbing of turmeric. Waving of the grind stone. Boy, is it heavy! Carol is surprised. Oops, we almost forget the waiving of the pot. 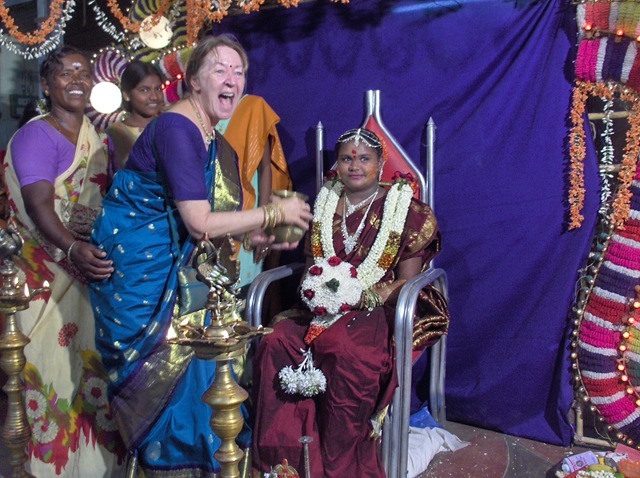 Carol is having a good time, and hopes that her lack of knowledge of the ceremony is not too offensive. 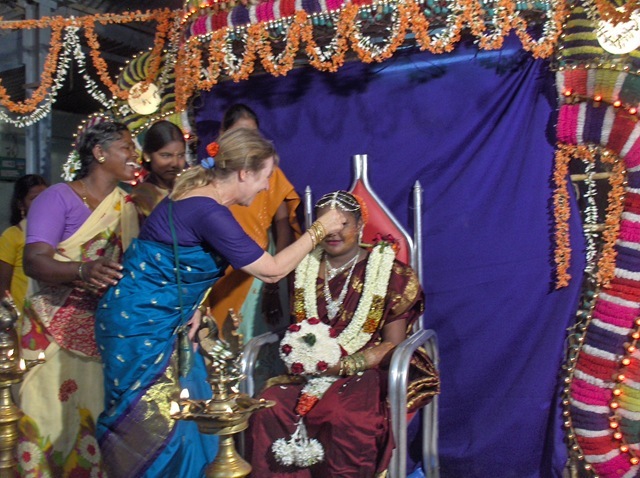 The final dotting with the kumkum solution. Then a moment together. The girl, now a woman, seems so sweet. The next day we found out that today most of the rickshaw drivers, the men of last night’s festivities, are going to take the afternoon off and have their own festivities. This consists of playing cards (a double-deck version of rummy, played for money. They like to gamble. ), drinking, and making and eating biryani. Today men do the cooking, without the women’s help. We feel fortunate to be invited to these events. Most Westerners see nothing of this. Or they might just notice a procession going by, and wonder what it is for. 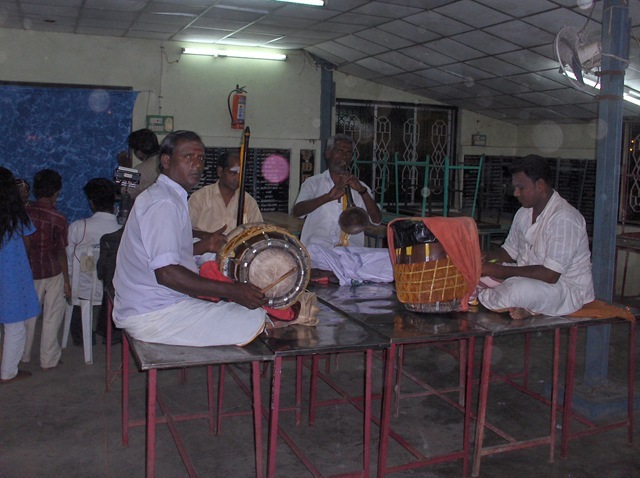 This entry was posted on March 17, 2009 at 7:13 pm and is filed under Arunachala, Festivals, Celebrations and Rites, Rites of Passage, Tamil Nadu, Tamil Women, Temples, Shrines and Ashrams, Tiruvannamalai, Travel in India, Village life. You can follow any responses to this entry through the RSS 2.0 feed. You can leave a response, or trackback from your own site. Very good for sharing this info. Our Rituals are very important. nicely written and excellent explanation…..fyi I am a malaysia tamil. I enjoyed reading your blog. 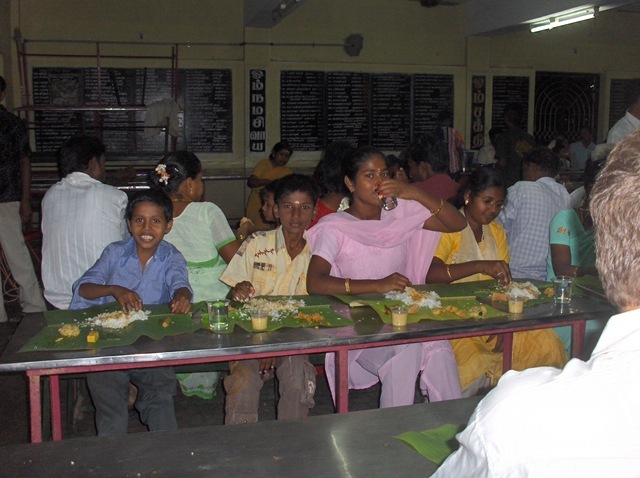 I had the pleasure of visiting Ramana ashramam about ten days back and climbing up the Arunachala. 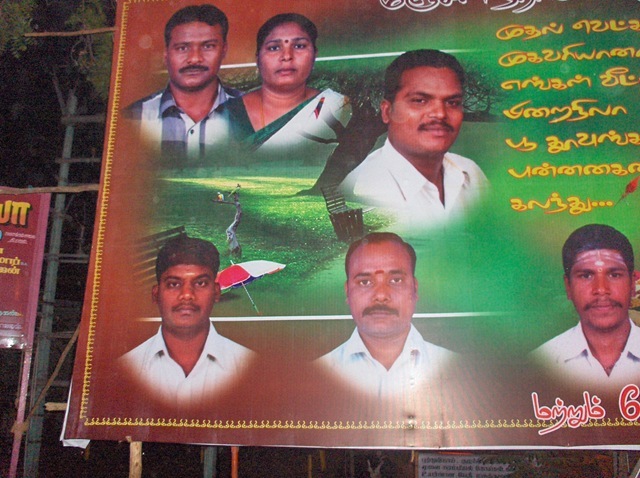 I am writing to you for permission to use the billboard on the manjal neerattu vizha for a piece that I am writing for my blog on posters in Tamilnadu. I will be sure to acknowledge you in the blog entry, of course. Certainly. Let me know if you need a higher resolution version of the photos. mAmA isn't the actual word! like many Tamil words this is a colloquialized version. 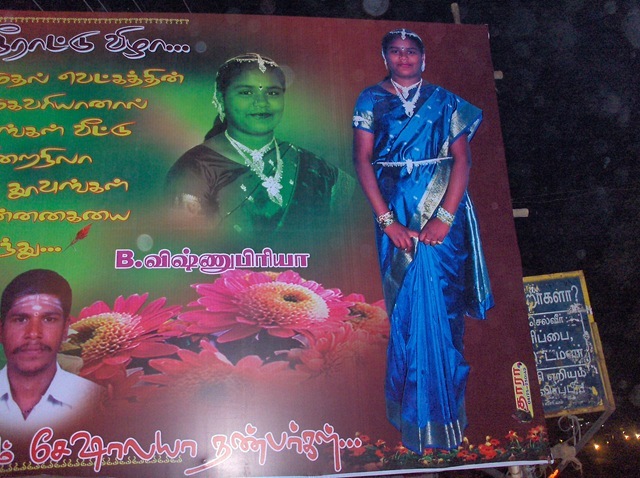 Acutal Tamil word was "thAi mAmAn" thAi= mother, mAmAn = maternal uncle. Richard & Carol: Exceptional blog. I have not been to TN since 1997. So used the SW desert here in the land of enchantment, wa afraid to go back, not to mention the cost. Now thanks to you both, I better go back.